Hello fellow Kitchen and Residential Design followers! My name is David Nolan, and I will be understudy for today. 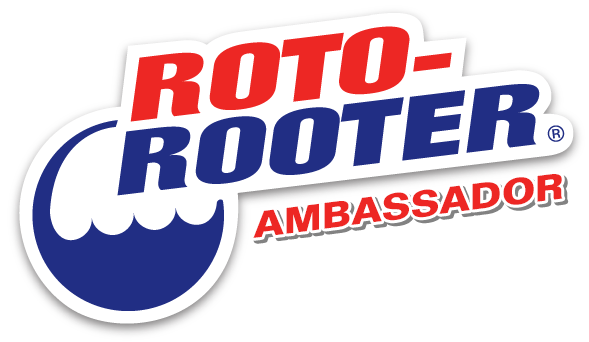 It is quite a privilege to be writing for Paul's blog, and a somewhat daunting task as this is my first post on any blog and I am the first of a series of more experienced guest authors. I hope for your sake they are all less nervous and more entertaining than me. Today I decided to do an artist profile on my good friend and neighbor, Feral Willcox. Unfortunately, we are only exploring her tile mosaic work because I can't possibly cover all of the creative outlets Feral pours her energy into - ceramics, sculpture, mandalas, music, gardening - in one post. Feral and I have enjoyed a friendship for years, and now I enjoy her creative side more as I regularly visit her studio/living space, which is conveniently located on the other side of our shared house. Our unique living situation with our landlady next door reminds me of Paul's symbiotic friendships with his former neighbor-down-the-hall Brandon (Where the Sweet Olive Grows) and his former next door neighbor Kevin (The Restless Sybarite). Good friends are wonderful to have, especially close by. 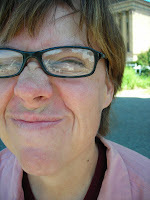 I am a multi-disciplinary artist, and everything I do begins with the letter P: Pottery, Poetry, Piano, and Pen-and-Ink. In all of these mediums, I'm most interested in Pattern. I'm a pattern junkie. I look for it everywhere I go. 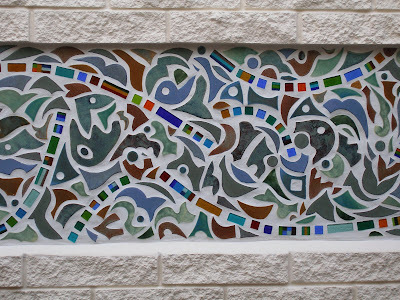 In ceramic art, this has led me to work with tile mosaic, and, in three-dimensional ceramic art, to explorations in surface design and texture. 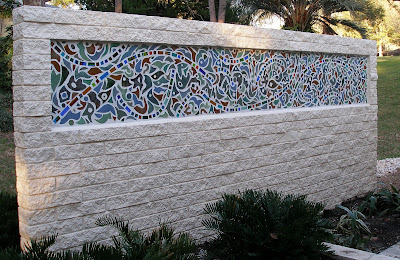 The first project I saw Feral working on was a large pool back splash for a gorgeous home here in Gainesville, Florida. I had seen pictures of the tile layout previously but when you see a monstrous installation like this up close and in person, the effect is overwhelming and disconcerting at first. Then your brain slowly grows accustomed to the myriad of shape and color, and you start to breathe again. If you click on this picture or any below, you will see the details of the tile and pattern. Each ceramic tile was individually rolled, cut, glazed and fired by Feral. 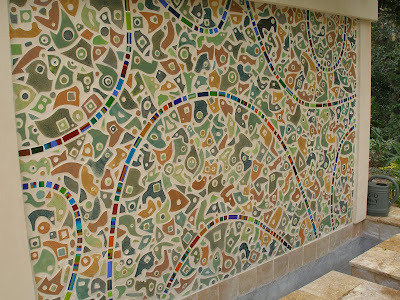 The brightly colored glass tile in the orderly arcs are by Karen Story at Dolce Glass Tile . The combination of textured earth-toned ceramic and smooth jewel glass interact well rather than clash. I imagine that once the pool was filled, the reflective quality of the water surface would only add to the playful chaotic beauty of the mural. The detail picture below is just the tile laid out on a white backing, without grout. The homeowners later commissioned Feral for a second mural for an exterior wall by the outdoor showers. This privacy wall can also be viewed from the master bathroom, bringing joyful color inside the home as well. This last photo was taken of a handsome tile backsplash Feral created for some friends in California. It is called "Trees Sneeze" for obvious reasons. Feral was in California teaching ceramics at a school in Los Olivos -The Dunn School - and some of the tile installation was done by her students as part of their education. If you are interested in learning more about Feral's incredible work, she can be reached at feralann (at) yahoo (dot) com. Her ceramic sculpture and pottery are featured in a local artist cooperative gallery here in Gainesville, called The Artistan's Guild. Stop in and see her work, in addition to 50 other area artists, if you are ever in our beautiful city. Love the tile work. That is amazing. You are so lucky to live next door to such a wonderful artist. Thanks for sharing! Wonderful, engaging work. I really appreciate how Feral makes complex patterns work with the shapes and colors she chooses. She makes what could be chaos quiet and happy. Way cool. HMG: I am lucky to live by Feral - she is an inspiration artistically. Nancie: I could not agree more with her ability to manage the chaos, and turn it into something meditative. Absolutely beautiful ... 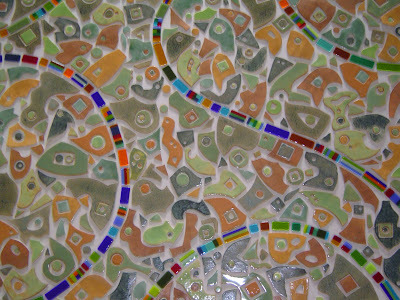 I love how her mosaics are so structured and symmetrical and balanced, really nice! How can I get one of these in my house? Jamie and Adrienne: I am sure that Feral will appreciate your compliments and feedback. Jenn: If you are interested in talking to Feral about a mural of your own, write her at feralann (at) yahoo (dot) com. Feral was surprised to learn that there are people or programs out there that troll the web looking for email addresses, hence the (at) and the (dot) in her address. I would not want her bombarded with inappropriate spam ads offering her "more stamina" and "extra length". Wish I still lived near Feral -- but we did Pack some of her Pottery to Idaho with us. The murals are stunning, and she is also a gifted Poet who works Particularly well with Pattern in that genre, too. Fantastic stuff David, thanks for this post. You've been telling me about Feral's work for ages and it's great to get a glimpse into the artists' mind as well as seeing her work. It's beautiful stuff, please extend my thanks to Feral for OKing this profile. Incredible movement in these pieces! Beautiful, beautiful work. Welcome back Paul. I am so glad that I was able to get a profile up of Feral's work also. A lot of other people seem to like her work also from the comments here. Michele, maybe sometime we can have a poetry selection from Feral on here also. Nicola, Feral does seem to have the ability to make firmly cemented tile have motion and life. Its even more apparent in person.